The early winter debut of the Donnelly EMP tires put this review into a window that had a lot of interruptions by……….well, Winter! Thankfully that is all behind us now and Spring is in full force in the Mid-west. That means that it is time to give my final word on these aggressively treaded Donnelly tires. Did you miss the Checkpoint post? 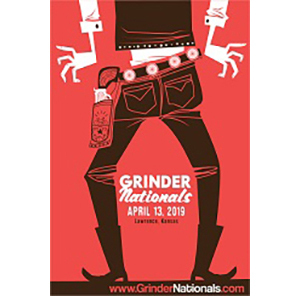 Find that by clicking here. The testing started again in earnest when the snow was still thick. Ride Performance: Winter started loosing its grip here and I didn’t wait to get out on the Donnelly EMP’s. 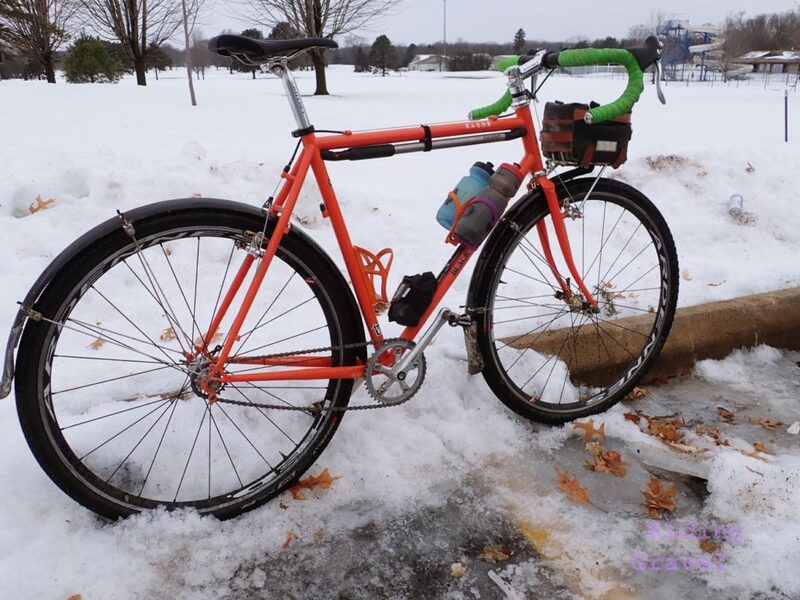 Snow and softer ice were clawed through with aplomb with these tires. I used a lower pressure than I typically would to gain better contact and maximize grip. The aggressive tread of the EMP allowed me to ride in these conditions where a smoother center treaded tire probably would have been a handful, or maybe would have had me walking more than riding. While the EMP does pick up the occasional stone, I had no issues with it flinging them all over me. I thought these sorts of conditions also showed how tough the tires are as I was cutting through thin ice over puddles and raking the tires through many frosty patches and chunky ice piles. It was not fast riding, but with care I was able to navigate and the tires looked none the worse for wear. Moving forward into “transition season”, where Winter fades and Spring hasn’t yet “sprung”, the mud and mire I encountered with the EMP’s was not much of a problem. The tires are what I would expect in these conditions- they pack up and then become rolling donuts of mud. Again- to be expected with a tire that has such deep tread blocks packed tightly together. But that isn’t a problem if you expect that, and you should with this tire. Pick up your bike and hike it if you come across a muddy minimum maintenance road. The EMP should be on your radar if you need a tire with grip and a tire that can withstand some abuse. Chunky gravel was fine, but here the narrower casing (38mm-39mm average front/rear) hurts the performance as the tire starts to push and hunt for a line instead of rolling up over the marbles. The same is true in sandier situations. That said, the EMP is ace on dirt, especially dry dirt, and anything smoother and harder surfaced, as far as gravel goes, is fine. That makes sense since the area the tire is named for, (the city of Emporia in the Flint Hills of Kansas) features more of a situation where the chunky rock gets pushed off the road leaving the bed rock and smaller stones behind, for the most part. Rough, uneven roads like this where steep ups and fast down hills are found will make this tire rise to the top of the heap in terms of performance. 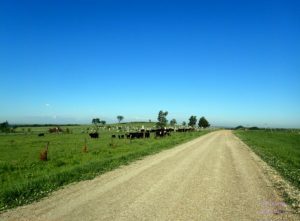 The EMP is named for the city in the Flint Hills and the roads in this area are tough. 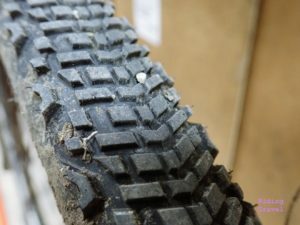 At The Finish: The EMP is a really nice tire and may be just what you need on a bike with minimal clearances, or for a fast dirt ripper when things are dry. I think it lives up to its billing as a tire that can handle tough roads. Roads like those found in the Flint Hills, where this tire draws its inspiration, have some tough bones and the EMP can handle what they dish out, in my opinion. That said, there are faster rolling tires with more volume, and comfort for the rider, than the EMP. The EMP tire at 38+ mm is a fine addition to Donnelly’s choices though. I would not hesitate to run it in a bike with less clearance, or on a light weight, go fast set up where I wanted a tough tire with a bit of bite to the tread. Especially on faster roads where you have a component of dry dirt, embedded rocks, and hard packed gravel. This is where the EMP will shine, in my opinion. 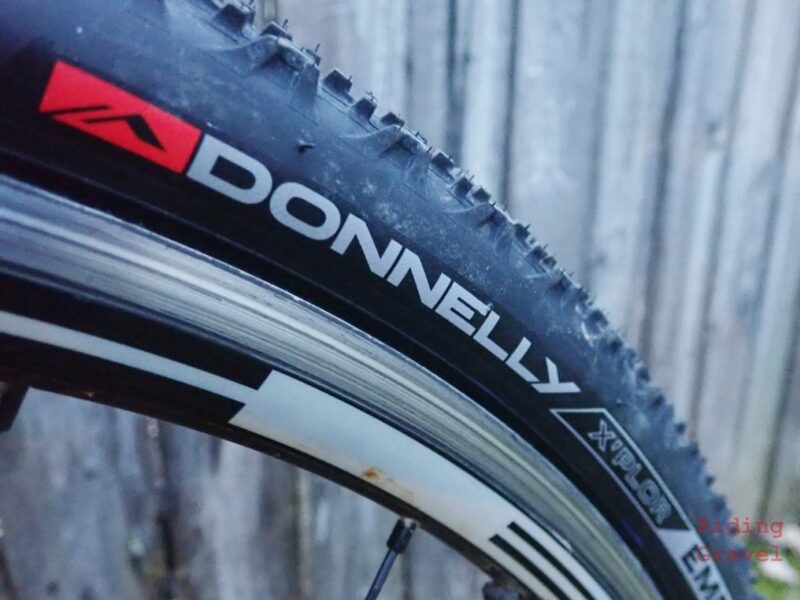 NOTE: Donnelly sent over the EMP tubeless ready tires at no charge for test and review. We were not paid, nor bribed, for this review and we will strive to give our honest thoughts and opinions throughout. 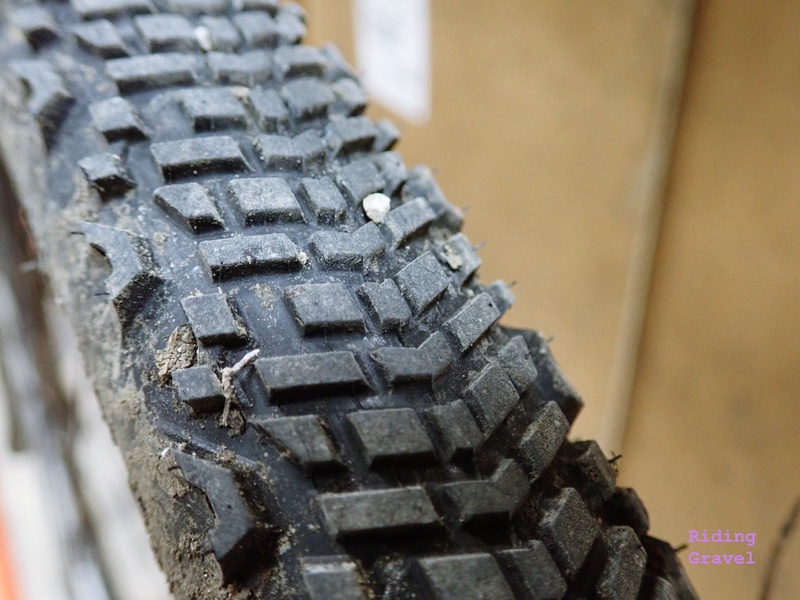 GT – thanks for the review of these tires. Can you compare/contrast to the MSO? Where would you definitively take one over the other? @TheBigE- The MSO is definitely a faster, more supple tire. So I think that for the majority of gravel I would be on, the MSO would be fine. I might swap to the EMP if I were out in the Rockies, out in the Appalachians, or anywhere it is rockier, especially a place with embedded rocks/bedrock like the Flint Hills. I would also opt for the EMP if I ran mostly dry dirt roads. Single track would be another place I would run those. But for my money the MSO does almost everything I’d ever need here.